These Flexible Cutting mats are made of virgin FDA approved food-grade plastic. They provide a hard cutting surface that protects your counter and won't dull your knives. These are dishwasher safe. 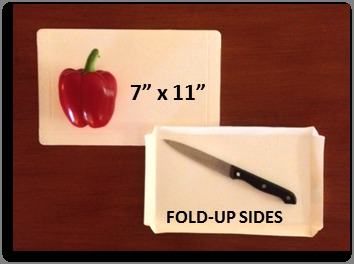 The mats are 7x11", perfect for slicing up smaller items. If used for personal kitchen use, and not a food service business, they may be re-used. But they are sturdy, and still inexpensive enough to be thrown after a single use.